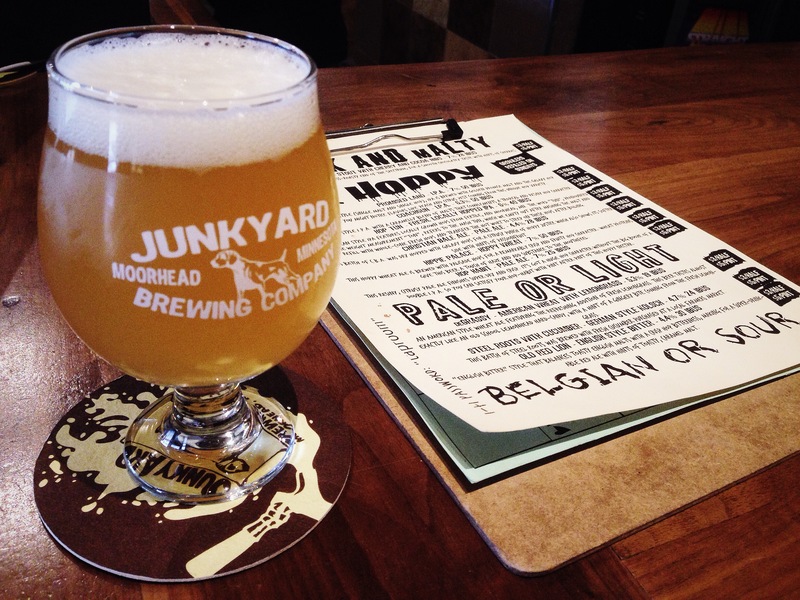 When asked to review a Fargo-Moorhead brewery, I immediately thought of Junkyard Brewing Company. Being a native ‘Fargoan’, I am constantly looking for new establishments to visit. Junkyard’s Taproom was just the place I’ve been wanting to try since I first heard about the beer a couple years back. As the F-M area grew, so did brewing companies such as this one that all started with the love of beer. 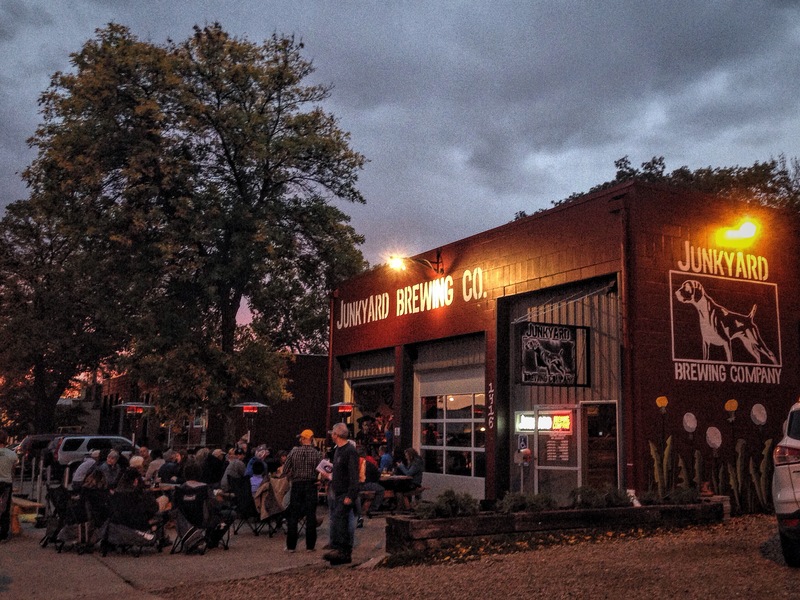 Junkyard Brewing Company is a nanobrewery founded by brothers Aaron and Dan Juhnke back in 2012. With a taproom located at 1416 1st Ave North, Moorhead, a block from Burger Time and a few blocks west of Buffalo Wild Wings, it is easily accessible if you’re coming from any direction, all as long as you can avoid the ever dreaded construction when in season. The Junkyard taproom embodies its name with a welcoming industrial look and feel, along with a seasonal outdoor section separated by two garage doors during the colder days. Entering the taproom, my friend and I were greeted by the friendly staff. Being my first time visiting, I thought we should take advantage of the staff’s knowledge of inventory. With it being mid afternoon on a Sunday, there were a handful of what seemed to be regulars in the brewery and I bellied up to the bar with the rest of the patrons. A large, color coded menu hangs over the ten beer taps, each color representing a kind of beer; green for hoppy, yellow for pale/light, blue for dark, you get the idea. We were handed a clipboard with a more descriptive menu of beers and took a minute to read through the options. The menu continually changes and a “Whats Cooking” menu gives you a preview of what will be on tap next. After careful consideration and debate, the obvious choice on the menu was the flight! In my experience, I always go with a flight if its my first time at a place so you can experience a variety of beers until you find your favorite, and sometimes you only need the one flight! My friend and I each decided to order a flight and share, that way we both get to sample more beers. We ended up sampling all 10 of the beers, and of those ten, this is the flight I would choose and recommend! 4) Steel Roots with Cucumber – A German Kolsch with of course the taste of cucumbers. I may be biased because I do love cucumbers, and drinks with cucumbers in it. While some of you may think this sounds gross, this pairing works really well. The slight bitterness (24 IBUS to be exact) with the clean cucumber resembles what I could only imagine a sour cider to taste like. And not that i have to speak any more highly about this beer, but this was brewed with cucumbers from a local farmers market! 3) Old Red Lion – I can only describe this as a very tasty, bitter, American tasting beer. I know this isn’t helpful for you readers because if you look on the menu it states its an English Style Bitter, but something about this rich, copper colored red ale was just excellent. Yes there was a nuttiness and slight caramel flavor, but it has the perfect bitterness to round out this English Malt goodness. 2) DeGrassy – A very different beer from the rest. This is a refreshing American Wheat Ale with an exceptionally not so subtle hint of Lemongrass. Outstanding! It was very light and had a great lemon flavor that if i didn’t know any better, I would have considered this a cider. I could definitely drink this at the lakes in the summer or in the middle of a blizzard. 1) Hatchet Jack – This dark, Baltic Porter has a very rich fruity, chocolate, and caramel flavor which I also thought had a slight touch of coffee. This full bodied malt beer is as delicious as it sounds. A little discretion: My beer of choice is a chocolate stout and this was their only dark beer on tap. Perhaps this is why the Hatchet Jack was my favorite, but I do have to say its one of the best Porters I’ve had. One of the more popular beers they suggested was Hop Tun. This earthy, semi hoppy, full bodied IPA is made using locally grown hops from Fertile and Moorhead, Minnesota. Being both a local and a farmer, I can see why this was one of the most popular beers, not only for the taste, but if any other ‘FMers’ are like me, we pride ourselves on anything local! And of course, our “best beer name” winner was the Christian Bale Ale! Sunday is a busy day at Junkyard Brewing Company. This is the day customers can bring in their Growlers and refill them for only $15-18, depending on the beer. Sunday is also Beers & Hymns (7-9pm) where anyone can come join in the singing of hymns or just sit back and enjoy the music with a delicious beer or other options off the menu like their Nitro Coffee. 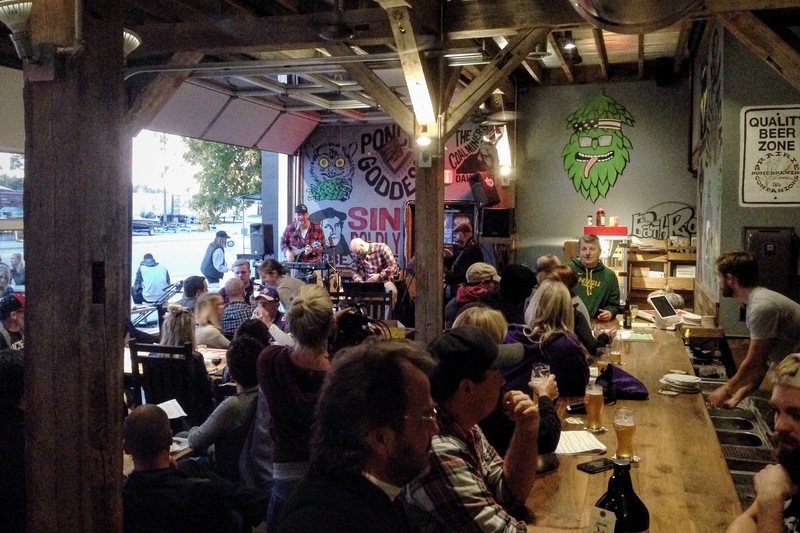 Sunday isn’t their only busy day however, the Junkyard Taproom has live music every night of the week featuring local artists 7-9pm weeknights and 9-11pm Friday & Saturday. If you have any questions about the Junkyard Brewing Company, their beers, events, etc. please visit their website www.junkyardbeer.com or look for them on Facebook. This is a great place to hang out, bring food in, and enjoy a variety of beers! And for all you love birds out there, It would make a great place for a date, because not only is the atmosphere great, you can’t beat the prices for this quality of beer. The Junkyard Brewing Company lived up to all of my expectations and surpassed them. I highly recommend a visit to their taproom! When I’m not working, I enjoy photography, sports, traveling, acting as a beer enthusiast, and if I’m lucky, all of them combined!